Living in a fairly small flat has meant for us that storage solutions are essential. Megabloks at the moment. 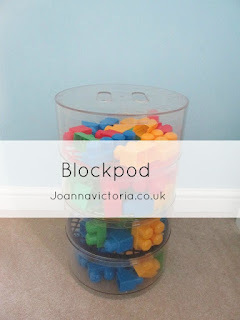 When I was asked if I was interested in trying out Blockpod I jumped at the chance as I thought it would be ideal for storing Blake's Megabloks in so that we could save room in his toy box but also have them on display in his room. When it arrived I was very impressed with the design of it. I love that it is clear so that you can see the Lego, Megabloks or any other toys you may choose to use it for. The plastic is quite sturdy too which is obliviously important when you have adventurous kids. To open it you have to turn the lid anticlockwise I had to have a few goes at this as it was tricky to open to begin with. As I've got use to it though its now pretty easy to open. Basically you have 4 layers of storage where you have 3 different plastic grids in the bottom of each section, each a different color. And the holes in the grid are different sizes as well for your different sizes of Lego to sift through. One of the things that grabbed my attention to it is that you don't have to use it just for Lego you can take out the grid's and use it as toy storage. I also love that some point this year Blockpod are going to be releasing more grids, layers and lids. I love the idea that by buying more layers and grids you can increase the size meaning you can store more Lego and/or toys. Another great thing is the 15 year warranty on any of the parts that become faulty during its ownership. We've been using the Blockpod for over a week now and love how its such a handy storage solution for us. Once Blake gets Lego I know this storage solution will be used even more and I would consider buying the additional grids and layers. What do you think of the concept of Blockpod? Would this be a handy storage solution for you? I feel for u we live in a 2 bed flat with 3 of us which is pretty tight as its a new build its so small. Its great you can buy additional layers so that you can fit all your lego in. Yes Blake is 15 months I'm definitely going to use it for that when he gets older. This is an ingenious idea. You can never have too much storage, especially with kids. I love the design of this! This looks great! My little boy gets his duplo everywhere. This is a fantastic way to store your stuff! I live in a tiny flat too so I'm always on the lookout for methods to maximise storage! I love how it turns toys into a display! I am always looking for better storage solutions as our house is so messy and this looks great! I love the concept of blockpod, it is always better to have more storage than you need then too little! Anything that can help sort Lego has to get my thumbs up! What a great idea. I used to hate sorting LEGO! Storage when you've got children just becomes a constant daily struggle! There is never enough of it, any ideas like this are welcomed in my house too.